Sara Stedy® builds on the success of Stedy®, a proven mobility-promoting support aid that encourages more mobile patients and residents to stand up independently. With a number of new enhancements, Sara Stedy helps to minimise manual handling by carers in an even wider range of care situations. With an increased inner width, a new seat shape and a safe working load raised to 182 kg, Sara Stedy also meets the standing assistance needs of larger patients. Enhanced features including a pivoting divided seat and pedal-operated chassis legs ensure improved comfort and support, and make working routines easier for carers. 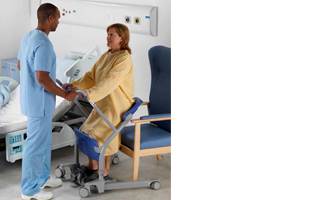 The innovative pivoting seat improves transfer efficiency and patient stability. Pedal-operated chassis legs adjust easily for optimum access during transfers. Handgrips integrated in the set allow the carer to easily turn the support aid. Provides extra stability or firm support when a patient cannot fully control leg movements. New total-lock castors provide complete stability when the aid is stationary. Smaller castors and redesigned legs mean a lower chassis for better access.